Our team of doctors, chiropractors, nurse practitioners, and physician’s assistants treat each patient as a person, not a number. Our comprehensive team approach allows us to attack your pain from every angle. We work together to help eliminate your pain. Research and regenerative therapy allows us to treat your pain with cutting edge technology. Our research department conducts clinical trials and research studies to keep us alert to new and exciting pain treatment options. We use our data and findings to help manage your pain. Sadly, opioid use and abuse kills more people every year than car accidents. We work to get our patients off opioids. 52% of our patients come off opioids after beginning treatment with us. Opioids have a place in pain management, but we only use them if we find it absolutely necessary. For those in chronic pain, there may be confusion. At Arizona Pain Specialists, we are always working to find the cause of your pain. Your specific pain may come from any number of causes, and it is our life’s work to not only find these causes, but then to treat them with our interventional procedures, chiropractic care, and behavioral health programs. At Arizona Pain, we work to find the cause of your pain. Your specific pain may come from any number of causes. It’s our goal to find these causes and find you relief. 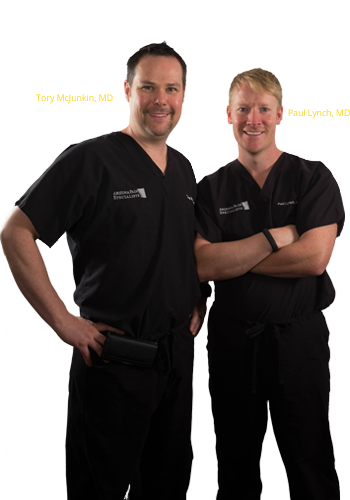 At Arizona Pain Specialists, we want to help you find the source of your pain and achieve the normal lifestyle you lost. We might recommend that you undergo a minimally invasive, non-surgical procedure in our state-of-the-art, on-site procedure center. Many of the treatments we perform show instant results and help our patients reclaim their lives. Our comprehensive team approach includes on-site chiropractic care, acupuncture, behavioral therapy, and a procedure center. Suffering from agonizing low back pain, pounding neck pain, throbbing headaches, or shooting facial pain drastically affects your quality of life. Pain is more than a physical sensation. Pain is exhausting, frustrating, limiting, and debilitating. But there’s good news: You don’t have to live in chronic daily pain. At Arizona Pain, we are passionate about treating those who suffer from pain. We empathize with chronic pain’s burden on you and those closest to you. We provide life-changing, intelligent, and comprehensive pain treatments. We successfully treat all types of pain. Our treatments are safe, minimally invasive, and clinically proven to be highly effective. Come see us at one of our conveniently located Phoenix valley offices (Scottsdale, Glendale, Gilbert, and Chandler). Most new patients are able to be seen within a few days of calling to schedule an appointment.